Smiles4SickKids: Thank you card and halloween card winner! A huge thank you to all the ladies who participated in our October challenges: Halloween cards and all occasion thank you cards. Kardsforkids owner Bela was generous enough to deliver the Halloween cards, so thank you very much for that Bela! I hope your last delivery was a success! 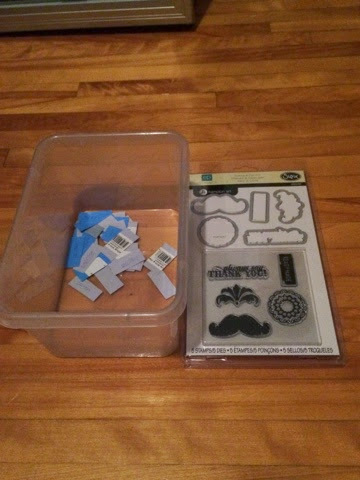 Since November is the month of Movember, I thought it was only fitting that the October prize followed the Movember theme. 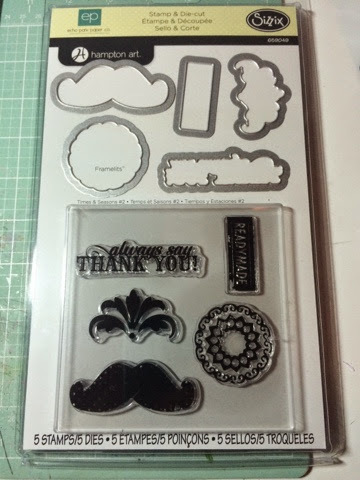 This set is a collaboration between sizzix and Echo park and contains both dies (for a die cut machine) and matching stamps. For every 5 cards that matched Octobers' theme you got one entry into the prize raffle. You also got an entry for every 5 goodies you wonderful ladies contributed. Goodies included altered notebooks, pencils, erasers, cute bandaids, Stickers etc. All the names of those who contributed went into a bucket and my fiancé picked out the winning name. Congrats! I will be contacting you about your prize! Don't forget that Novembers themes are : nurse thank you cards, Christmas cards and Hanukkah cards! Decembers theme is teenager cards! Get your entries in for a chance to win a prize!